Sydney is one of the most visited cities in the whole of Australia and its tourist attractions really are quite simply world class. 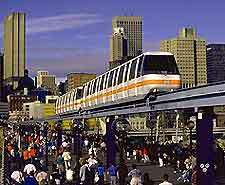 Ranging from amphibious tours of the harbour and helicopter flights, to waterfront eateries lining the Circular Quay and a futuristic monorail, there is much more to Sydney than its Opera House and Harbour Bridge. Other popular attractions awaiting tourists visiting Sydney include a host of beaches and many superb coastal vantage points, such as the Gap, Johnstons' Lookout, Kings' Cross and Queenscliff. For something in the way of evening fun, tourists may like to consider trying out their luck on the gaming tables at the Star City Casino on Pyrmont Street. 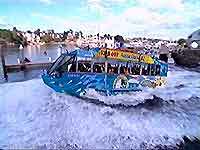 The Aussie Duck is an exciting and fun way to take a guided tour of the Sydney area. Starting from the city centre, the Aussie Duck travels both on land and in the harbour, and this unique guided tour of the city lasts approximately one and a half hours. 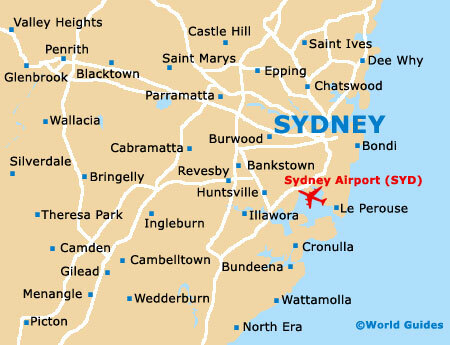 Blue Sky Helicopters provide one of the most spectacular and memorable ways to see the spreading city of Sydney - from the air. 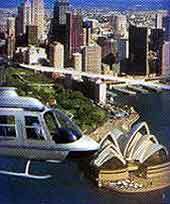 Flying over Sydney Harbour, the city centre and the numerous beaches, Sydney's Blue Sky Helicopter tours last around 30 minutes. The Sydney Visitors' Centre, in the central Rocks area of the city, is housed in a historic building dating back to the mid-19th century. Providing useful tourist information about some of the most popular sights and general things to do when visiting New South Wales, the Visitors' Centre also organises many guided tours of the area and is also home to a museum about the city's rich Australian heritage. The Blues Point Reserve, in the Lower North Shore area of the city, is a large open, elevated area, with spectacular panoramic views, and many nearby shops, cafés, restaurants and bars. Cruises are a particularly popular way to travel around Sydney and provide some stunning views of the city's impressive Skyline, whilst dining. Bounty Cruises are located in the Inner West area of the city and travel around the harbour area. 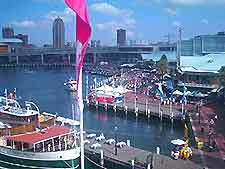 The central Circular Quay is a busy port and has become a major tourist attraction in its own right. With cafés, eateries, impressive harbour views, water taxis and regular cruises, Circular Quay has an exciting and friendly atmosphere. The Cronulla and National Park Ferry Cruises provide regular cruises around the backwaters, in the south of Sydney. These scenic cruises last around three hours and take in a number of particularly important sights, including a number of fascinating Aboriginal landmarks. 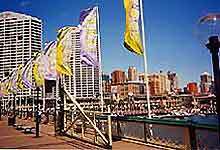 Darling Harbour is situated in the Central Business District, with wonderful views of the waterfront. Home to a large conference centre, numerous shops, restaurants and cafés, exhibitions and major tourist attractions, the Darling Harbour has become a trendy area of the city and is always busy. The Domain, in the heart of the city, is a large public space which is regularly used for important public events, festivals and concerts. Situated in the Eastern Suburbs, the Elizabeth Bay Marina is within easy reach from central Sydney and features many attractions for tourists visiting the area. These attractions include small boats for hire, deep-sea fishing trips and harbour cruises. The Gap is one of the city's most breathtaking cliff tops, with walking trails, spectacular views, and seating areas. Perfect for scenic picnics, the Gap overlooks Watsons Bay and the surrounding ocean. Kings' Cross, in the Eastern Suburbs of the city, is the vibrant and enticing red-light district, with many strip clubs, bars, nightclubs, adult shops and restaurants. The impressive Open-Air Cinema is located in central Sydney and features many outdoor performances throughout the year, including theatrical events, festivals, concerts and film screenings. Other attractions at the Open-Air Cinema include a nearby restaurant and bar. Opera Australia is located in the Eastern Suburbs and has become a big player within the city's renowned arts and music scene. Opera Australia features performances throughout the year, at venues including the Sydney Opera House and the Victorian Arts Centre. The Parramatta Heritage Centre is situated in the Greater West area of Sydney and features many interesting displays about the city's extensive historic past. Attractions at the Parramatta Heritage Centre include many local artefacts, guided tours, activities and seasonal events throughout the Sydney calendar. Located in the Northern Beaches area, Queenscliff is a stunning vantage point, with incredible views across the ocean, Manly Beach and the surrounding city. Queenscliff is a popular place for picnics, walking and relaxing in general. The Star City Casino is one of the largest entertainment complexes in central Sydney and is home to restaurants, bars, theatres, shops and an enormous casino, where you can play Roulette, Blackjack and all of the other traditional gambling games. The historic Mounted Police Stables are located in the south of Sydney and date back almost 200 years. With regular guided tours and a number of interesting attractions, the Mounted Police are actually the world's oldest police force. The popular Sydney Observatory is located in the city centre and dates back to the mid-19th century. Now part of the Powerhouse Museum, regular guided tours of the Observatory are available, being suitable for those with even just the slightest interest in astronomy.